The DCA is proud to be supporting the addition of supportive women's housing units at the Cornerstone Project, to be constructed starting in March 2010 on Booth St corner of Eccles, site of the old Loeb grocery store. 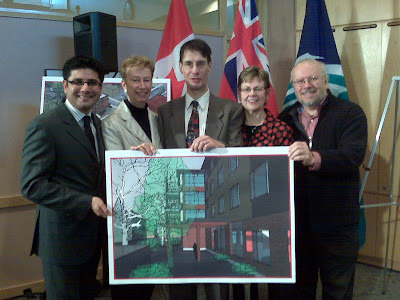 Councilor Holmes, Royal Galipeau MP, Jim Watson, MPP, Sue Garvey of Cornerstone, Yasir Naqvi MP. Present but not in the picture: Clive Doucet, Mayor OBrien, Grace Xin (Chinatown BIA), about 60 volunteers and friends that turned out to get the project launched. Thanks to the hosts, Somerset West Community Health Centre. Royal Galipeau and Sue Garvey with the Olympic Flame that made a surprise visit to the launch.